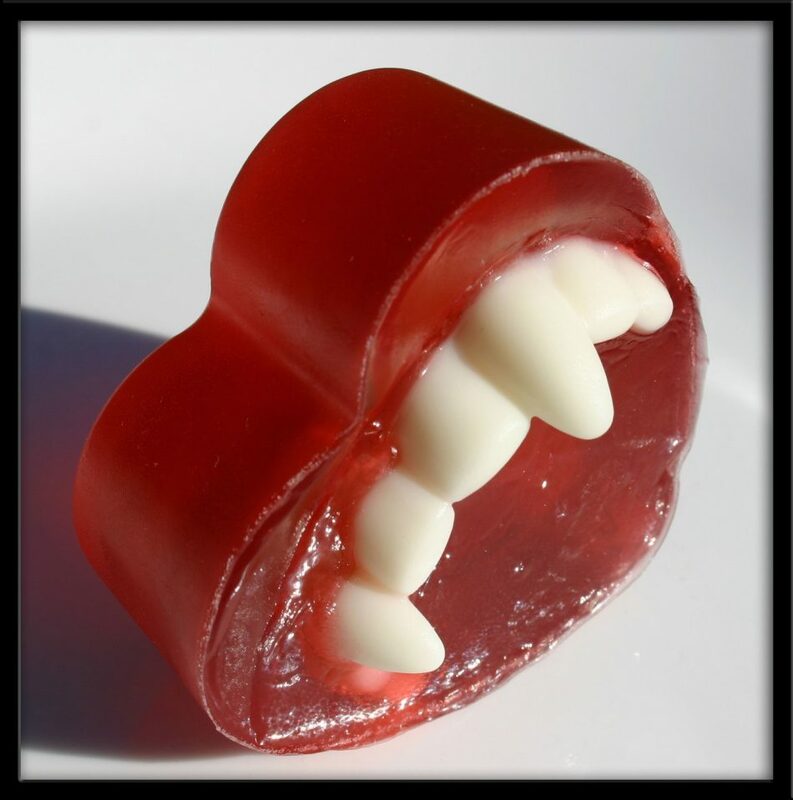 Vampire Love Bite Soap, a product sold by NewLeafSoap through Etsy. The seller notes “Smelling faintly of ripe berries, you’ll be tempted to bite…” Available for CAD$7.17, there were three left at the time this article went to press. Picture: NewLeafSoap/Etsy. Last year on Vamped, we went dark side and suggested some naughty gifts for that special vampire in your life. Before you check them out, be warned they aren’t safe for work! I figured this year we would do something a little more traditional with classy romantic gifts, things that are age appropriate for a general audience. I also chose to stick with Etsy this year for all five items except the bonus last item. They always have such unique items that you can’t find anywhere else. I came across this handmade glass blown necklace on Etsy. Although it looks like a blood drop, the seller makes sure to point out straight off that “it is not made from actual blood.” Phew! What I liked about this was the simplicity of it of the design and the price. You can purchase the pendant alone or with a silver chain. If you get the chain included, it jumps the price to CAD$39.09. It ships from the states and for me to get it delivered in Canada, it would be an additional CAD$9.12. It doesn’t specify for other countries so contact the seller if you have any questions. I’m sure your special lady would love this one! 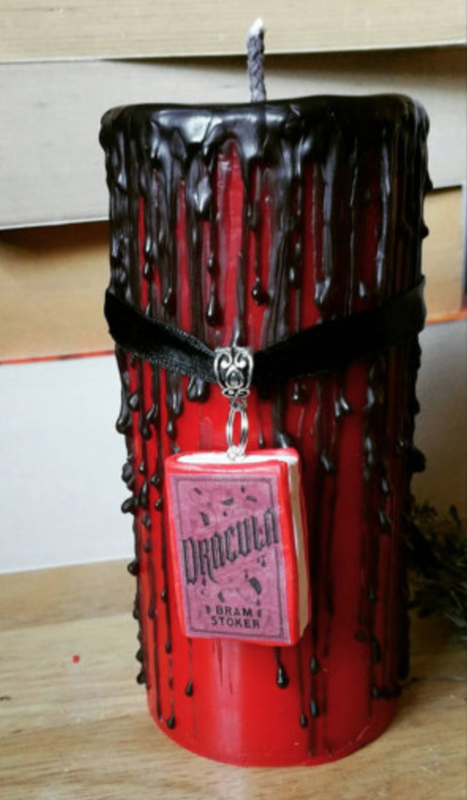 This “Dracula inspired red pillar candle complete with book charm” is a great way to set the vampire mood. The candle is handmade from wax, while the book charm is made from clay. It says the burn time is 40–50 hours and after you are finished with the candle, you can keep the charm to use on a keyring or necklace. I was surprised to see the seller, FirstEditionCandleCo, was located in a small town in the United Kingdom called Okehampton where I have been many times. This made it a downside for being located in Canada as the shipping is CAD$20.27, almost as much as the candle. They also have some other cool candles sporting other themes including graveyards, Frankenstein, witches and Halloween. This vampire perfume oil is handmade and is vegan! It’s made from these natural ingredients including fractionated coconut oil, rice bran oil, proprietary fragrance blend, vitamin E and isn’t tested on animals. This bottle of happiness is actually made in Toronto and shipping in Canada is CAD$17. If being a vampire bride isn’t your thing, they also have other scents available including Mina Vampire Perfume. Nothing says romance like an intimate bath with that special someone. I checked out a bunch of different bath bombs, but this one caught my eye because it starts off red and then bleeds black after. I think the scent combination of tulips and raspberries is intriguing. You can also get a custom scent if you want and they have other flavours to choose from including a bright range of coffin shaped ones. Just like the perfume oil, this one is handmade, vegan and animal cruelty free. The biggest downside is the shipping. It comes from the United States and somehow costs $31.27 to come to Canada. That is more than the bath bomb! These hand-painted wine glasses are the perfect accompaniment for any romantic meal or special occasion. I even saw a product review on the Etsy store where someone ordered the glasses for their wedding. They can be used with blood or wine, depending on your personal preference. Besides vampire glasses, the seller also does different themes like Halloween, gothic, and skulls. You can pick from her current stock or she will also make any type of glasses you want at no extra cost. This item comes from the United Kingdom, and again shipping to Canada is quite pricey at CAD$31.54. This may be worth it if the shipping price stays the same and you order multiple glasses. Well, there you have it folks. 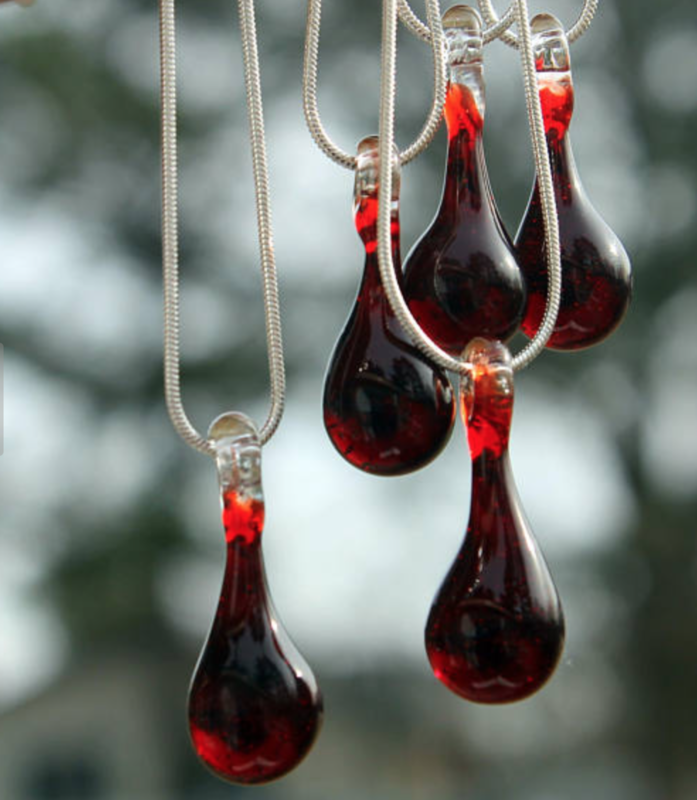 Some vampire wine, bath bombs, candles, perfume and a vampire necklace for your lady will help you have the ultimate romantic vampire fun filled Valentine’s Day. Blood Drop Necklace, Boro Glass Pendant, Anti Valentine Glass Jewelry Necklace, Vampire Lampwork Hand Blown: UntamedRose, Etsy, accessed Feb. 12, 2018, https://www.etsy.com/ca/listing/206154839/blood-drop-necklace-boro-glass-pendant?ga_order=most_relevant&ga_search_type=all&ga_view_type=gallery&ga_search_query=vampire%20valentine&ref=sc_gallery-1-1&plkey=32936b50731cde3dd3c72082b48237e0e1eff3fd:206154839. archive.is link: https://archive.is/L2wCl. Horror Decor – Gothic -Vampire – Horror Candle – Gothic Candle- Goth Gift- Macabre Candle- Vampire Lover -Goth Decor – Curio Candle: FirstEditionCandleCo, Etsy, accessed Feb. 12, 2018, https://www.etsy.com/listing/264988158/horror-decor-gothic-vampire-horror. archive.is link: https://archive.is/JXcAX. 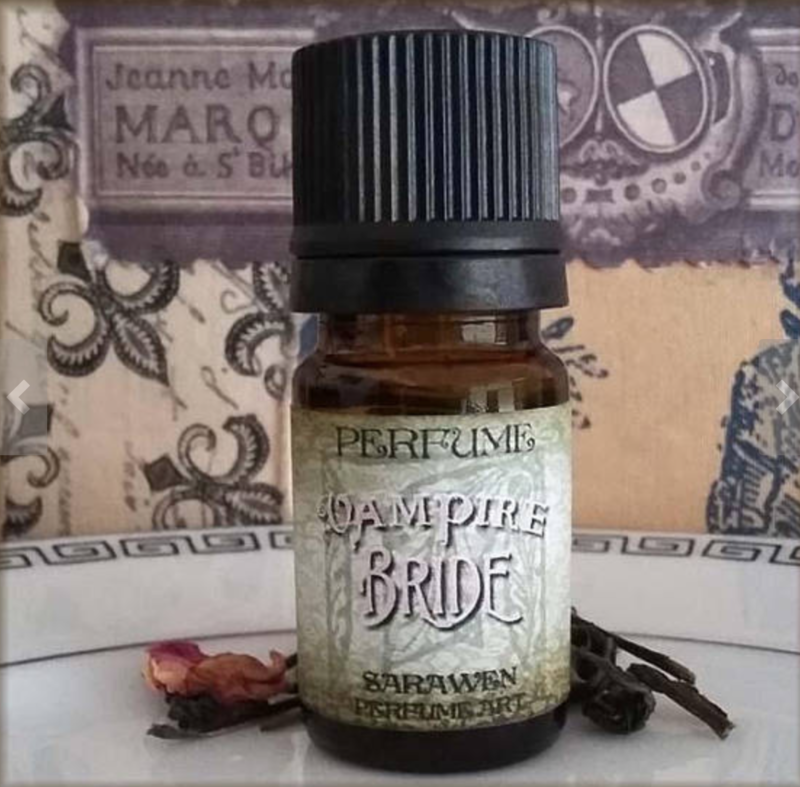 VAMPIRE BRIDE Gothic Perfume Oil / Honeysuckle Honey Musk / Inspired by Dracula Perfume / Vegan Perfume Oil: SarawenPerfume, Etsy, accessed Feb. 12, 2018, https://www.etsy.com/ca/listing/90404730/vampire-bride-gothic-perfume-oil?ga_order=most_relevant&ga_search_type=all&ga_view_type=gallery&ga_search_query=vampire%20perfume&ref=sr_gallery-1-8. archive.is link: https://archive.is/jhdaU. 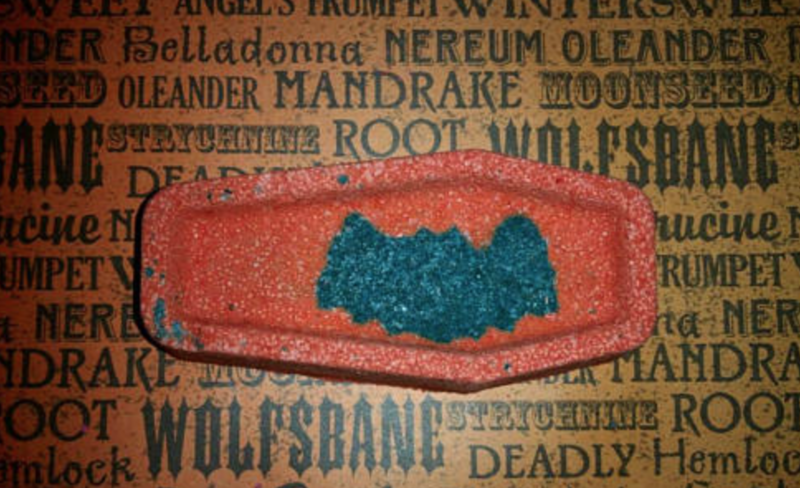 Dracula Bath Bomb | Coffin Bath Bomb | Vampire Bath Bomb | Goth Bath Bomb | Vampire Coffin Bath Bomb | Bram Stokesrs Dracula: NightshadesCellar, Etsy, accessed Feb. 12, 2018, https://www.etsy.com/ca/listing/512835360/dracula-bath-bomb-coffin-bath-bomb?ga_order=most_relevant&ga_search_type=all&ga_view_type=gallery&ga_search_query=vampire%20bath%20bomb&ref=sr_gallery-1-32. archive.is link: https://archive.is/5pSXx. 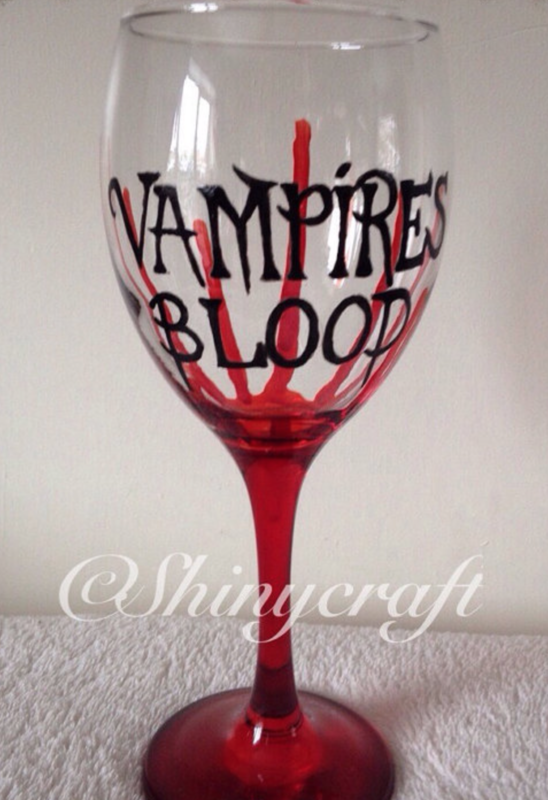 Vampire Wine Glass, Handpainted, Gothic, Goth, Vampires, Alternative, Blood, Horror, hand painted, Halloween Party, Halloween Glass: Shinycraft2013, Etsy, accessed Feb. 12, 2018, https://www.etsy.com/ca/listing/473716945/vampire-wine-glass-handpainted-gothic?ga_order=most_relevant&ga_search_type=all&ga_view_type=gallery&ga_search_query=vampire%20wine%20glasses&ref=sr_gallery-1-13. archive.is link: http://archive.is/DHewN. suggested some naughty gifts: Erin Chapman, “Love After Dark: 5 Naughty Gifts for the Vampire in Your Life,” Vamped, February 14, 2017, accessed February 12, 2018, http://vamped.org/2017/02/14/love-after-dark-5-naughty-gifts-for-the-vampire-in-your-life/.